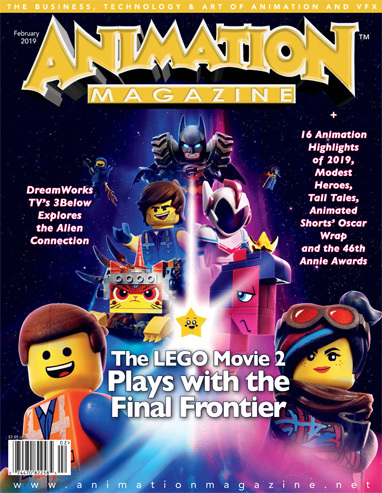 Directors Mike Mitchell and Tricia Gum bring new perspective, various forms of animation and lots of humor to the new Warner Bros feature The LEGO Movie 2: The Second Part. Studio Ponoc’s Modest Heroes offers three beautifully told tales of bravery in the face of life’s many challenges. ON Animation brings the charming insects of AntoonKrings illustrated children’s books to life in the new movie Tall Tales. The three talented exec producers of DreamWorks TV’s 3Below: Tales of Arcadia discuss the challenges and creative journey of the much-anticipated new series. We catch up with some of the biggest composers working in the animated feature business in this look at the music of Spider-Man: Into the Spider-Verse, Incredibles 2, Ralph Breaks the Internet, Isle of Dogs, Mirai and Smallfoot. The 46th Edition of the Annie Awards promises to be another memorable night celebrating the year’s best achievements in animation. A look back at the many amazing men and women who left us in 2018. A recap of the ten big tiles vying for nomination in the Best Animated Short Oscar race. An interview with young filmmaker Perry Chen who discusses the making of his new animated short inspired by this father’s life, Changyou’s Journey. If madcap medieval humor is your thing, you won’t want to miss Tigtone, Andrew Koehler and Benjamin Martin’s wild new Adult Swim series. VFX supervisor Kevin Baillie shares some of the secrets of building lifelife CG dolls for Robert Zemeckis’ Welcome to Marwen.